Figured I’d post something I drew since I barely seem to do that here anymore. 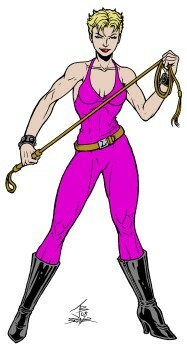 It’s Linda, a very, very bad woman from the old arcade game, Double Dragon. I drew a picture of her in practically in the same pose a few years back but that didn’t turn out so well. Too cartoony. This is more like it. It’s weird because I was thinking of drawing it over again recently because I need art of her for a few ScrollBoss projects. Out of the blue, a friend of mine e-mails me because he needed the old pic for a fan game project. I was glad that he wanted to use my art, but I felt bad because it was a bad picture. So that was sign that I need to draw her again. Plus, it’ll be good to have a pic of her that matches the quality of that Abobo pic I did last year. 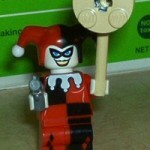 I bought that Lego set with Harley Quinn just for the minifig. Seriously. The Batman Begins-style Batman that comes with it was immediately put aside for trading fodder and the other parts are still in their bags to be sorted later on. It comes with some of those little diamonds and gems that you can put into a treasure chest and has lots of good vehicle parts. 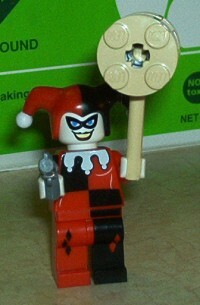 But, really, it’s all about Lego Harley Quinn.